Lost Map are pleased to announce that our spiritual captain, Pictish Trail, has signed to Fire Records. As you can see from the photo above, he's so overwhelmed with excitement that he is expelling a viscous pink liquid. This doesn't mean he's abandoning Lost Map, but rather tying our DIY dinghy to a much sturdier vessel. To celebrate, our Picty is heading out on a never ending tour. First up there's a batch of solo dates, supporting KT Tunstall around Europe, followed by some full band appearances at events in Paisley, Aberfeldy, Stirling and Edinburgh, mixed in with some stripped-back three-piece shows, on his headline UK tour Winter Rewind Acid Reflux. 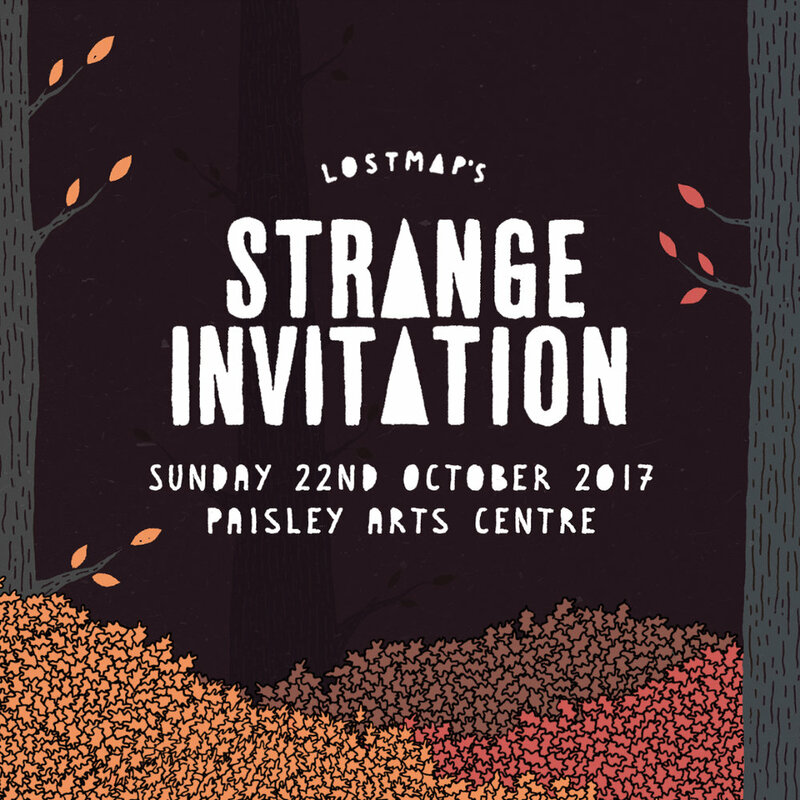 Our second Strange Invitation event is taking place at Paisley Arts Centre on Sunday 22nd October in the year of our Bart 2017. It's part of a series of acts taking place in Paisley throughout October, as part of their annual Spree Festival. We're really chuffed that they've asked Lost Map to be involved, and we've put together a suitably top bill for the occasion. Lost Map is so very, very excited to share with you some new music by Monoganon. 'Black Hole' is the opening track to the forthcoming album, Killmens, which will be released on LP, with accompanying magazine and download, on International Men's Day, Sunday 19th November 2017. Monoganon is our dear friend John B. McKenna - a Scottish singer-songwriter and multi-instrumentalist, currently living over in Malmö, Sweden. His previous album, the fantastic F A M I L Y , was the first ever release on Lost Map, back in 2013 - and, following a series of limited edition cassette releases, Killmens marks his glorious return. Lost Map Records are delighted to welcome the debut EP from London lo-fi dreamy-grunge quartet Lazy Day - the project of Tilly Scantlebury and pals. The seven-track Ribbons EP was just released on Friday (15th September) on 10” vinyl and digital formats, and the band will be taking the songs on the road for their first UK headline tour, which begins in Guildford tonight - Monday, September 18 and takes in 12 dates around the country. The video for the shimmering and soaring song ‘Hiccup’, the latest song to be previewed from the Ribbons EP, is available to watch and share now, above.